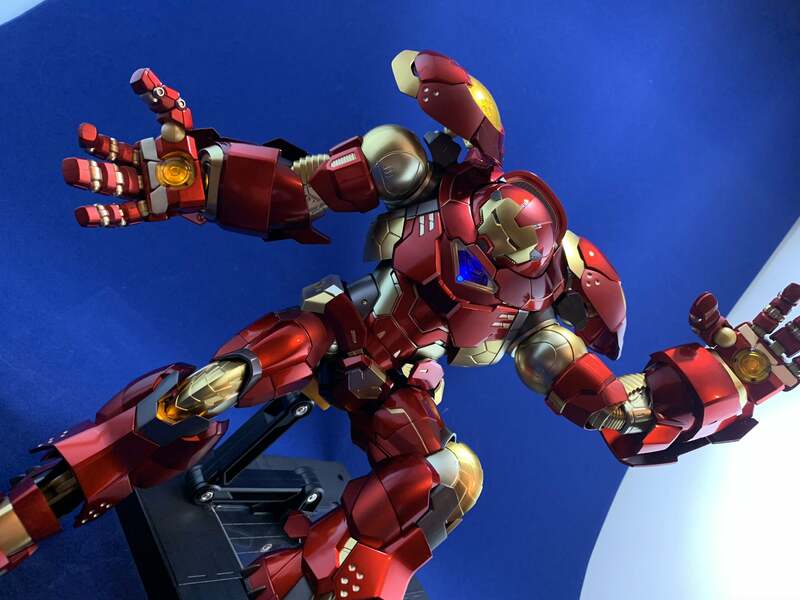 Sentinel Re:Edit Iron Man #05 Hulkbuster action figure unboxing and review – AiPT! An impressive figure that’s just the right size and excellent features. Who doesn’t love the Hulkbuster? When it was revealed in trailers we’d get a look at it in the MCU via Avengers: Infinity War I couldn’t wait to see it after it’s excellent introduction in Age of Ultron. No doubt its appearance in these films is a big reason why Sentinal made this impressive figure which originally went on sale in 2016. This figure has been out for a few years now, but it recently has been getting slashed in price both at Amazon and online toy stores. Knowing I’d be getting the upcoming Mezco Hulk I had to have this, because what is a Hulk without a Hulkbuster?! This figure came in at about $250 dollars and I think that’s just about a steal. Not only because of the quality, but also the additional features you don’t see in an average toy. Check out the unboxing below to see what I mean. As you can see this figure requires a bit of work to activate its lights, but beyond that, it’s a sturdy highly posable figure. It comes with a meaty stand which is great since no ordinary action figure stand could hold this thing. The detail and design of this figure are way above par with good articulation and a nice foresight for different posing options. The fact that you can flip up the helmet to reveal Iron Man underneath is a big bonus. The lights are a great feature and while it takes a few seconds to flip all 6 switches it’s a cool effect. The only downside of this figure that I noticed when handling it was how certain poses weren’t possible since the hinges weren’t quite tight enough to hold. It might be because the arm is too heavy to hold up in a pose, or maybe my figure had a looser joint, but it was a bit of a bummer to see an arm droop for the price I paid. This is an impressive figure which comes with an impressive price. If you have the cash I’d say this is probably the best Hulkbuster on the market and it comes in at a great size to match the conventional 6-inch action figure. This is an impressive figure which comes with an impressive price. If you have the cash I'd say this is probably the best Hulkbuster on the market and it comes in at a great size to match the conventional 6-inch action figure.